3. THE HEALTH AND HEALING REVOLUTIONARY: That you receive the secret of health transformation by which you should stop ageing and recover effortlessly from all kinds of disease and illness known or unknown to you or to health practitioners. 5. TRANSFORM THE WORLD: that you seek to teach the whole world and its inhabitants the above principles of life in the New World Order for human and universal transformation. By this the whole world will seek after you for solution(s) to all types of global menace including terrorism, climate change and world peace. 6. UNITED PEACEFUL WORLD: That you build mankind to unite in faith, love as better co-leaders of the universe with God and to take their proper position. It is a great privilege and honour that God has revealed to Nigerians first amongst over 7.8 Billion people in the world for the effectuation of the New World Order for Human and Universal transformation. And it is with this secret of life and prosperity that Nigeria and Nigerians like you shall begin to effectively order universal transformation from one nation to another. No matter how free or how automatic or automatic a thing is, it will always require some forms of human commitment or action. 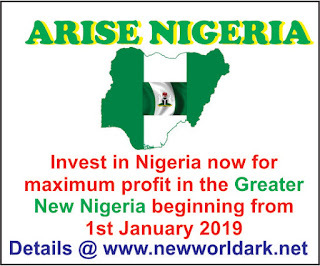 Therefore, a greater hope is revealed for Nigeria and Nigerians to have a better life with complete security and prosperity and to lead the world into the next stage of human and universal transformation. This hope is not theoretical but according to the revealed instruction of God which you should obey. Beloved, you cannot pay for this secret of life. NO, you can’t pay and that I why I want to give it to for free and as a great reward and outward from God.